Side Load ATV Trailers - Learn About the Top Features You Need. Side load ATV trailers seem to generate a lot of disagreement about which ones are best. Or if maybe a rear loading trailer is better. We'll take a look at several of the most popular models to find out what makes them the best side load ATV trailers. And if they would be the best for you. Advantages of Side Loading ATV Trailers. They offer the most efficient use of the deck space. Narrowest towing package so they're easier to see around. More secure tie down and towing stability. Easy drive on and drive off loading without having to use reverse. Now that we know about the advantages of side load ATV trailers, let's see what top features you need. If you would like to get some idea of the type of ATV trailers that are for sale, just click the link below. Side Load ATV Trailers and More. Side load with fold up ramps. Removable ramps - that store underneath the trailer or along the sides. Gas mileage gains are reported to be as much as 6 mpg! Fold-up ramps - that stay in place to help secure the ATVs or whatever else you happen to be carrying. If security is more important to you than mpg, this can be a good solution. 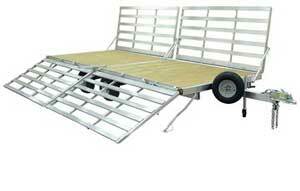 Integrated tie-down points - You can almost never have too many tie-down points on a trailer. The D-ring type that hide in the deck are favorites. Multi-use capability - If you need your trailer to do more than carry ATVs, accessories are available that will turn it into a multi-tasking demon. Flat bed - Nobody wants to deal with inner wheel wells. You want a nice flat, unobstructed surface for all your stuff. Light weight - Since gas prices have skyrocketed, lighter weight aluminum atv trailers have been getting more popular. But you need to consider your own needs. If you really beat a trailer up, aluminum may not tolerate the abuse. If that's not a problem, the lighter weight is an advantage everywhere else. Wider radial tires - The more ATVs you carry the more desirable the added stability of wider tires becomes. Radials tow better, are tougher, last longer, and have less rolling resistance. Enclosed lights - Lights recessed into the trailer will insure they continue to function. Side load ATV trailers seem to have more action going on around them, so any lights sticking out are just asking to get knocked off. Protected Wiring - Same deal as the lights. When you're loading and unloading ATVs and gear from all sides, it's a lot more likely any exposed wiring will get damaged. Non rusting finish - Your trailer is gonna get muddy and wet. Aluminum has the advantage here because it will never rust. Many manufacturers now offer rust resistant finishes on both the trailer and the fasteners holding it together. Sealed wheel bearings - Will last a lot longer in the wet, muddy conditions they'll be exposed to. Smaller wheels lower deck height. Low deck height - Makes loading and unloading much less exciting. Plus the lower center of gravity will be more stable going down the road. If you are considering side load ATV trailers, we hope we've been able to point out some of the features you need to consider. Now for the fun part, shopping.